Katowice (Poland). 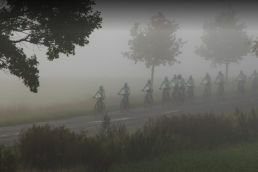 The Moving for Climate NOW cycling team, an initiative promoted by the Spanish United Nations Global Compact Network and Iberdrola, has today arrived in Katowice (Poland) after travelling more than 600 kilometres by electric bicycle since it left Vienna (Austria) on Monday. The initiative’s aim is to make society aware of the need to act urgently against climate change using all available mechanisms. Coinciding with the start of the Climate Summit (COP 24) in Katowice, Moving for Climate NOW has been welcomed by the United Nations Climate Change Deputy Executive Secretary, Ovais Sarmad, and the Head of Climate Policy Unit of the Minister of the Environment of Poland, Jakub Gibek. During the meeting, the team handed Sarmad and Gibek the Manifesto Against Climate Change that they have carried throughout the cycle ride. 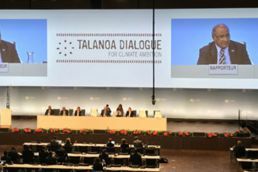 This document focuses on the Talanoa Dialogue, a space for conversation designed to encourage the participation of governments and civil society in achieving the climate goals agreed at the Paris Summit in 2015. The Moving for Climate NOW Manifesto states that “the Katowice Climate Summit is going to be very important because now is the time to finalise the main elements of the Paris Agreement and implement the conclusions of the Talanoa Dialogue to inform future climate action, also taking into account the conclusions and guidelines of the IPCC special report on the impacts of global warming of 1.5 oC and the magnitude of the measures required”. It also calls for a just transition that pays special attention to vulnerable communities and leaves no one behind, and in which the energy sector plays a key role, contributing to the development of a model based on clean energy, sustainable mobility and energy efficiency. During the meeting, Ovais Sarmad praised the work of the cyclists taking part in the ride “for inspiring the world to move in the right direction to fulfil the promise of the Paris Agreement”. “This is the most important COP since the signing of the agreement, and we need initiatives like yours to testify that governments, the private sector and individuals can work together to tackle climate change by committing to multilateralism”, he added. The director of Energy Policies and Climate Change at Iberdrola, Carlos Sallé, affirmed after delivering the Manifesto that “we need to change the story and explain to citizens that the decarbonisation of the economy is less costly than non-decarbonisation: we are already facing the costly problems that arise from the burning of fossil fuels, through government budgets for health and infrastructure”. Sallé added that “the fight against climate change is an obligation, we have to turn risks into business opportunities and we have to increase both ambition and urgency”. For their part, Victor Viñuales, deputy chairman of the Spanish United Nations Global Compact Network, has stated that “climate challenge is one of the pillars of Agenda 2030 and such an urgent challenge, that it cannot be tackled individually. Collective action through partnerships increases our chances of success and we want to expand the level of commitment to reach as many stakeholders as possible”. “Moving for Climate NOW is the metaphor for our challenge: a journey to a low-carbon economy, which implies effort, vision and committed partners along the way”, he summarised. 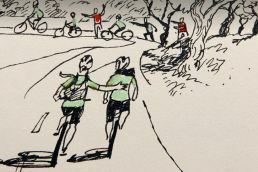 Moving for Climate NOW is now in its third iteration, after pedaling to the Marrakech Climate Summit in 2016 (COP 22) and Bonn in 2017 (COP 23). In this new iteration, the ride departed from Vienna (Austria) on Monday 26 November and arrived today in Katowice (Poland), coinciding with the start of the Climate Summit (COP 24) that begins in the city. The team is made up of over 40 people from different organisations and countries, in line with UN Agenda 2030 SDG 17 (partnerships to achieve the goals). On this third ride, the Moving for Climate NOW cycling team has brought together representatives from associations such as the International Energy Agency (IEA) and the International Renewable Energy Agency (IRENA), government bodies such as the Spanish Office for Climate Change and the Biodiversity Foundation, institutions such as Sustainable Energy for All (SEforALL), the International Institute for Sustainable Development (IISD), the International Institute of Law and the Environment, the Partnerships for Green Growth and the Global Goals 2030 (P4G), Neoenergía, the Brazilian Business Council for Sustainable Development (CEBDS), Africa Greenco, the African Development Bank and Bloomberg NEF, representatives from non-governmental organisations such as ActionAid, the European Federation of Transport and Environment, Peace Boat and The Climate Reality Project, as well as university centres and think tanks such as the Pontificia Comillas University, the Federal University of Rio de Janeiro, the Basque Centre for Climate Change (BC3) and the national rugby team. As on previous occasions, the rally will comply with gender parity, in line with compliance with SDG 5. The United Nations Global Compact is the biggest voluntary corporate sustainability initiative in the world. It has two objectives: on the one hand, to implement 10 universally accepted principles to promote corporate social responsibility (CSR) in the areas of human rights, labour standards, the environment and the fight against corruption in companys’ activities and strategies. And on the other hand, to get the private sector to contribute to the objectives of the United Nations, currently the Sustainable Development Goals (SDG). The Global Compact is working for sustainable development through multistakeholder and public-private alliances. As a United Nations initiative, it pursues the organisation’s development goals, the main one being the fight against climate change, which is essential for the development of people, societies, the planet, prosperity and justice. Iberdrola is a global energy leader, the number one producer of wind power, and one of the world’s biggest electricity utilities by market capitalisation. The group is present in numerous countries and supplies energy to over 100 million people mainly in Spain, the United Kingdom (Scottish Power), the USA (AVANGRID), Brazil (Neoenergia) and Mexico. With a workforce of 34,000 and assets in excess of €110 billion, it posted revenues of over €31.263 billion and a net profit of €2.804 billion in 2017. Almost two decades ago, Iberdrola realised that climate change was a real challenge for humanity that required urgent action. It also realised that the electricity sector was key to providing solutions to combat this global problem. In this context, a few years ago Iberdrola launched its Action Plan on Climate Change, which focuses on four main areas: playing a leading role in major international organisations and business coalitions, active involvement in international negotiations on the United Nations Framework Convention on Climate Change, implementation of a Social Awareness Plan with internal and external measures and implementation of internal actions for climate change mitigation and adaptation. Iberdrola is the only Spanish company and the only energy company taking part in the debates in the technical phase of this Dialogue.